When we are outside and experiencing the full onslaught of winter, we know that what we receive comes from above. Little do we realize, often this weather is controlled by conditions a lot higher than we think! In fact, there is increasing research showing the stratosphere can have a strong influence on the weather patterns we experience at the surface. 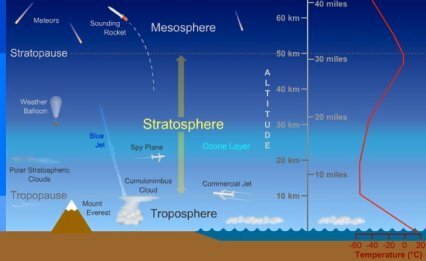 The stratosphere is the second layer of the earth's atmosphere, situated above the lowest layer 'the troposphere'. The stratosphere starts at an altitude of ~6 miles (10km) and extends up to ~30 miles (50km). It is so named because the stratified layers within it have a temperature profile that increases with altitude. The stratosphere holds the ozone that absorbs harmful UV radiation and prevents it from reaching the surface. So how does this layer affect our weather? Every winter the stratosphere over the North Pole cools, this begins when the sunlight can no longer provide the energy to heat the ozone. Without this energy, the stratosphere cools rapidly, creating a thermal imbalance with the warmer stratosphere further south. This imbalance creates a large pressure difference and combined with the Coriolis effect, creates a large strong jet stream, circumnavigating the globe in the stratosphere in an eastwards direction. This system is known as the polar night jet, and contained within it is a strong vortex - known as the polar vortex. The polar vortex increases and decreases in strength depending upon how cold the polar stratospheric atmosphere becomes during winter. The colder the polar stratosphere becomes, the stronger the polar vortex - and vice versa. The strength of the stratospheric polar vortex influences the atmosphere below it in the troposphere. The troposphere also has a strong vortex over the North Pole during winter, this occurs due to tropospheric temperature and pressure differences. The strength of the stratospheric vortex helps govern the strength of the tropospheric vortex and this directly affects the strength of the jet stream. In colder stratospheric conditions the jet stream becomes stronger; the stronger the jet stream, the straighter it flows and during winter, this normally keeps it on a collision course with the UK. A powerful jet stream is associated with unsettled and milder air, often with periods of heavy rain and windy conditions as one depression after another charges in from the Atlantic. In warmer stratospheric conditions the jet stream takes a more meandering path due to a weaker polar vortex. This allows cold air to spill further south. If the UK is in the firing line of the cold air then this will lead to colder (often more settled) and possibly snowier weather. 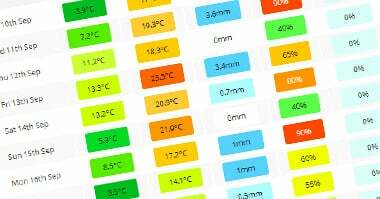 Looking back at the last two years one can match the preceding stratospheric conditions to the November and December weather experienced. The warmer stratospheric conditions in 2010 led to a very cold start to winter. However, the colder stratospheric conditions seen in the early winter of 2011 have led to a far more unsettled start to winter, with gales being a prominent feature. There is one further dramatic stratospheric phenomenon that can occur occasionally during the polar winter, this is known as a Sudden Stratospheric Warming. A Sudden Stratospheric Warming occurs when there is an abrupt warming of air, which is introduced into the vortex. The reasons behind this are complex and the results are dramatic. The stratospheric polar vortex can completely disintegrate and the winds flow in the opposite direction. This can have an amplified effect on the weather patterns seen in the troposphere, with a higher increase in .blocking patterns. that inhibit the normal flow of the jet stream. These disruptive patterns can last up to two months and once again colder weather can be experienced at latitudes further south. One example of a Sudden Stratospheric Warming occurred in late January 2009 - the effects were felt very quickly, in early February 2009. The winds came in from the East, bringing snow and below average temperatures. This warming, and the effect on the polar vortex in 2009 can be viewed on the following striking NASA animation. So, next time it snows or you observe gales, remember that the weather you experience may be dictated by the polar vortex pattern, tens of miles above us in the stratosphere over the North Pole!